Top 10 plants that recurred at the Chelsea Flower Show. All very New Vintage. These plants turned up in several gardens and are clearly very much loved at the moment. I would like to see all of these plants in any New Vintage planting scheme that I might do. Most of them also fall in to the”naturalistic” style of planting which has been so popular in recent years. 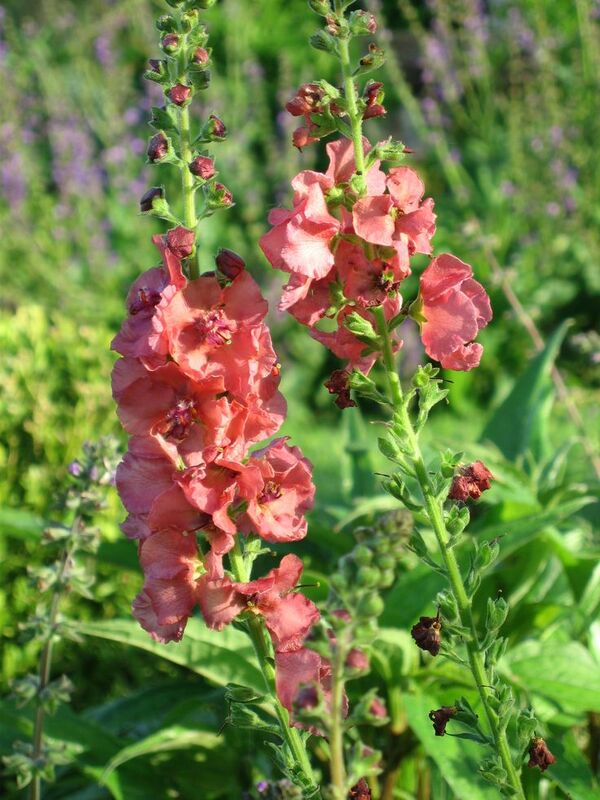 But the essence of New Vintage is to merge the look of contemporary planting with some of the old favourites such as peonies, verbascums, irises etc and to include some lovely COLOUR which has been singularly lacking in recent planting schemes. I noticed that this year there are touches of colour coming back. You only have to see Cleve West’s M & G garden , and the Positively Stoke on Trent to see these images coming in. But there is no need to go mad with colour in a New Vintage planting plan. It can be soft and subtle with a touch of bright blue (see the irises) or puce (see the peonies) to bring some wonderful contrasts. This was seen in almost every garden. Nothing smacks of the country as much as this plant. It reminds one of hedgerows and banks as a child when the cow parsley festooned the sides of the roads – and still does! How romantic and New Vintage can you get?! https://www.carolinegarland.com/cms/wp-content/uploads/2014/05/IMG_1737-Small1-300x200.jpg 300w" sizes="(max-width: 720px) 100vw, 720px" />This appeared in several different cultivars. It is wild and almost weedlike but incredibly popular amongst grasses in a naturalistic planting scheme but equally good in a New Vintage romantic setting. A. ‘Black Barlow’ and A var. ‘Stellata’ were popular. A perfect plant for a whispy shaggy look and surprise surprise there is an Astrantia major called ‘Shaggy’, but many others made their mark – A. ‘Rubra’, A. ‘Buckland’, A. ‘Venice’, A. ‘Roma’, A. ‘Florence’, ‘Hadspen Blood’ and many more. Very very pretty and a must for an early flowerer in a New Vintage garden. Tiny Geum heads were planted in amongst lower plants – G. ‘Lemon Drops’ was a favourite and G. Mrs W Moore made an appearance. Very sweet fillers at the front of a New Vintage border. Almost every garden had a blue Iris in it. Favourites were – I. ‘Dark Desire’ and I. ‘Perry’s Blue’. An Iris is a majestic plant and although it is early flowering no New Vintage garden is complete without them. Plant in clusters or singularly to give a spike of colour amongst other softer plant colours. There are so many to choose from but this year blue seemed to be the IN colour! L atropurpurea ‘Beaujolais’ appeared in at least three gardens. This coupled with Sanguisorbas gave lovely claret red spikes or bottle brush tips to taller planting. Very pretty in the middle of a New Vintage border. Stunning varieties on display – Paeonia ‘Bowl of Cream’, P. ‘Duchesse de Nemour’ and P. ‘Lord Kitchener’ to name but three beauties. Their fat luscious faces bring all the components of informal planting together giving structure amidst the froth. No New Vintage garden can be without them. An absolute favourite this year – particularly ‘Trollius ‘Alabaster’. 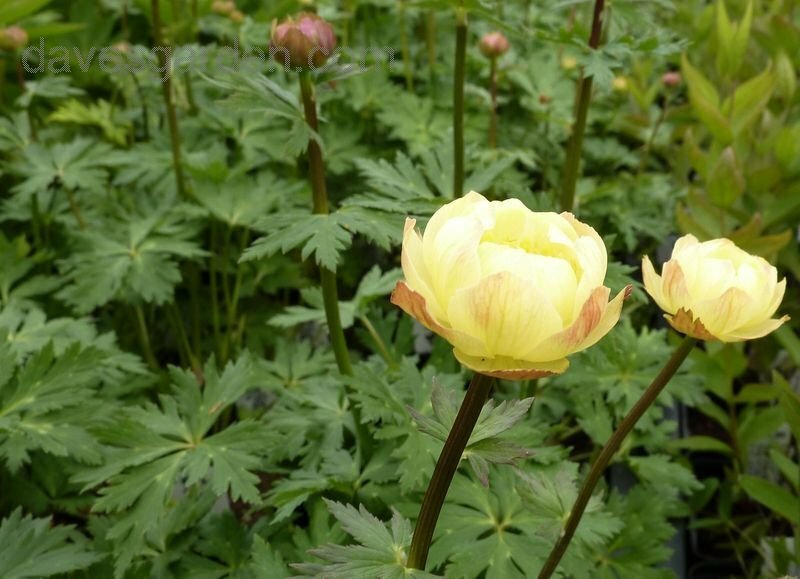 These large soft yellow almost buttercup shaped flowers are shade loving but light up the dark. V phoeniceum ‘Rosetta’, V chaxii ‘Album’ , V phoeniceum ‘Cherry Lips’ and V. ‘Lavender Lass’. All represented at the Show.. wow! But the one that wowed the most was Verbascum ‘Petra’. This is almost a burnt umber colour. A tall upright amongst a busy perennial border. Again a complete must for a New Vintage garden. The multi-stem tree is definitely the popular one at the moment and one can see why. They bring enormous focus and interest to any garden and are incredibly beautiful in their own right. Taxus baccata globes or domes – these were seen everywhere. We are very used to the Buxus dome but this year it was taxus punctuating the spaces. Their rich dark green sat well in the wild, naturalistic planting (No Man’s Land) but also were effective in more formal planting (The Daily Telegraph garden) but they would look wonderful in a New Vintage garden in amongst peonies, foxgloves, roses etc adding a backdrop to a romantic setting.